High up on Israel’s list of fabricated and otherwise shamelessly embellished achievements is that of having allegedly “made the desert bloom” promptly after setting up shop on usurped Palestinian land in 1948. Never mind that Palestine wasn’t exactly a desert – or that “blooming” techniques involved mass slaughter as well as plenty of ecological devastation. We mustn’t let facts get in the way of creation myths. In contemporary times, Israel has continued to market itself as a global pioneer in water technology and conservation, from drip irrigation systems to desalination. Of course, some might argue that Israel has enjoyed an unfair competitive advantage in the water realm given that it has been able to dominate access to the valuable resource by diverting regional waterways in its favour and literally hijacking Palestinian aquifers. Now, Israel is once again making disingenuous waves through the Israeli firm Water-Gen – which, a recent obsequious dispatch in the Times of Israel informs us, is “look[ing] to quench global thirst” by extracting water from air. Scarce water – or stolen? The Times explains that Water-Gen was founded by an ex-combat reconnaissance company commander in the Israeli military and is currently “controlled by Russian-Israeli billionaire Michael Mirilashvili,” vice president of the World Jewish Congress. Among the many reasons the technology is so vital, we are told, is that some 1.2 billion people – nearly one-fifth of the Earth’s residents – live in areas of water scarcity, according to United Nations figures. The UN website notes that an additional 500 million people are “approaching this situation, [and] another 1.6 billion… face economic water shortage (where countries lack the necessary infrastructure to take water from rivers and aquifers)”. The Water-Gen website meanwhile adds that “water is still the world’s number one concern, as un-safe water kills more people then [sic] wars”. Given that Israel has never exhibited any detectable qualms either about denying Palestinians access to safe water or about killing them, the image of Israel as aqua-messiah is, to put it mildly, a bit hard to swallow. Consider a Jerusalem Post article published the very same day (16 April) as the Times of Israel piece on Water-Gen’s global thirst-quenching mission. The Post reports on the dire situation in the Gaza Strip, where fresh water is “a scarce commodity” and where recurring electricity crises are not helped by the fact that “damage from the Israeli bombing of the [Gaza power] plant in 2014 has yet to be fully repaired”. The article quotes Robert Piper, the UN’s Humanitarian Coordinator for the Occupied Palestinian Territory, who warns that the latest severe electricity crisis could help unleash a “perfect storm” that results in a Gaza Strip that is fundamentally uninhabitable – a conundrum, no doubt, for the two million people that reside there. And while the West Bank may not lie on the direct path of the perfect storm threatening Gaza, the territory is hardly exempt from repression and plunder. There, Israeli-imposed water hardships have ranged from prohibitive fees for Palestinian communities to drastic supply cuts to outright theft of Palestinian water for use in hydrating illegal Israeli settlers and filling their swimming pools and other accoutrements. In an email to me back in 2013, West Bank-based environmental expert Alice Gray highlighted some additional clever Israeli manoeuvres in the area, such as “preventing Palestinians from building sewage treatment plants… and then prosecuting them under international law for cross-border pollution”. 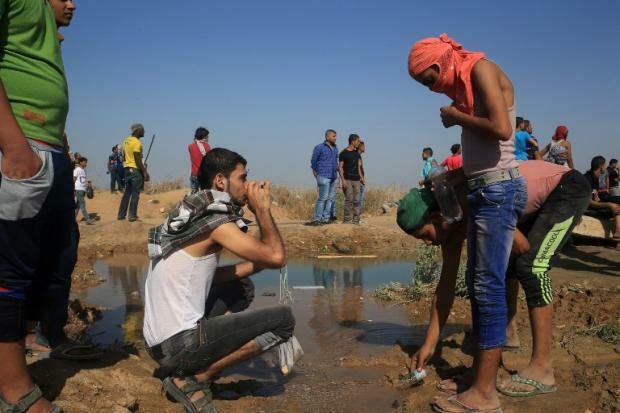 The previous year, an Oxfam briefing paper titled “On the Brink” noted that “water cisterns used by Palestinian farmers to collect rainwater are frequently demolished by the Israeli authorities, further limiting their ability to grow crops”. In other words: when it rains it pours. The character in question was, of course, former Harvard Law School professor Alan Dershowitz, tasked with an on-stage demonstration of Water-Gen technology at the American Israel Public Affairs Committee’s annual policy conference in Washington, DC. Dershowitz’s previous magic tricks include concocting a “continuum of civilianality” to provide legal justification for killing certain kinds of Arab civilians – as well as other behaviour suggesting that his place of employment might have been more aptly titled Harvard Psychiatric Ward. In sum, it seems it’s not so much about nobly rescuing a hapless, thirsty planet. It’s about securing Israel’s image and with it its highly profitable spot in the international order – using water from thin air to whitewash a system of institutionalised apartheid and ethnic cleansing. And that, surely, is something we can all live without.